It may be hard enough getting older and adjusting to whatever life brings your way, in addition you may be raising one or even a few of those who are younger than yourself, whether they be children, grandchildren, or even great grandchildren. According to the State Bar of California, 7 million children in the United States live under a grandparent's care. [i] Besides many legal complications you may face in raising and taking care of your younger loved ones there are many questions you may have faced when with raising grandchildren. Such as: how will I find the energy, how do I get them enrolled in school, how will I pay for the needs of the grandchild, how can I make my home safer, how do I make them feel safe, how do I preserve their spirituality? During the transitional phase from you becoming a grandparent to a full time parent to your grandchildren, you may face many difficulties. Some assistance through your state may be available financially. In which case it would be in your best interest to get legal guardianship of your grandchildren if you do not have it already. Talk to your local department of human services or Social Security office to learn about possible financial benefits. Find an Elder Law Attorney in your state. You may have to upsize your space to accommodate the needs of your growing grandchildren or you live in a strictly senior community and need to move because grandchildren aren't allowed in your neighborhood? If you've gone the legal route and obtained legal permissions to change your grandchildren's school, you may want to consider with your move if keep your grandchildren in their school is feasible. Consider if you are walking distance to all your needs and necessities from a potential residence. Does the area have a park or enough space for your grandchildren to play in with and/or without your supervision? You may only need to make a few adjustments to your home to make it safer. In which case, your tasks are easier however your stress may not be reduced, consider finding a specialist. Depending on the age of your grandchildren you may want to consider even the smallest of things such as plug/outlet covers, toilet seat latches (lid locks), cabinet latches for younger grandchildren. If you own a firearm or other weapons (cross bow, axes, swords, etc), consider a cabinet to keep them locked up or a locked room. Cleaning products need to be stored and secured to make sure accidental ingestion does not occur. Find a Relocation Specialist in your state. Find a Home Remodeler in your state. In need of childcare, most state agencies have a referral department for childcare. In Utah, a list is provided by the Department of Workforce Services. This method of finding childcare is preferred because they are state certified and your family may qualify for reduced price meals if you are lower income, the same reduced price meal program that the states may provide in school. Eating well balanced meals with plenty of vegetables can aid in increased energy levels, decrease vitamin deficiencies and overall health for both you and your grandchildren. Counseling, even only temporary, may help the family dynamic and help your grandchildren in adjusting to the new family situation. Regardless of the relationship between you and your grandchildren, it is common for a child to feel lost and even use aggressive or passive behavior. Some counseling may help a child feel as if they have someone on their side to aid in mediating between you and your grandchildren. Maintaining a spirituality for your grandchildren and maintaining your own is very important and may also aid in Mental Health. Maintaining your grandchildren's spiritual health, if different then your own, will include an amount of respect and freedom. Getting acquainted with their spiritual leader and having a conversation about the spiritual needs of your grandchildren may be the best way to show your grandchildren that you are on their side and you respect their beliefs. Do not force your grandchildren to believe in your own spirit deities, this may cause distrust and a feeling of forcefulness from possibly already fragile grandchildren. If possible, the best thing to do for your grandchildren may be to let them remain in their current school, at least for some time. Your grandchildren may find stability in the school they are in. If it is necessary to move them, wait as long as possible. If it is not possible, discuss the change in schools with your grandchildren and let them help in picking the new school so they feel a part of the process and develop a sense of ownership. 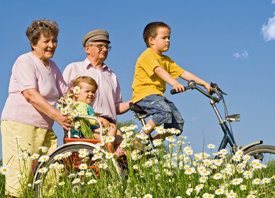 Maintaining regular schedules for your grandchildren is a benefit to any transitional family. Your grandchildren will know what to expect and when to expect it, which may be a nice change from the chaos of moving to a different household and possibly different school, friends and more. Though this might sound tedious and boring, it will be in the best interest of everyone, as this may make living from day to day much easier on all parties involved. Grandchild involved in sports, clubs and more may help socially. In addition, this may help ease the burden on the family by giving you the free time you were previously accustomed to. Though some of the decisions that have to be made cannot involve your grandchildren, it can be important to let your grandchildren feel as if they have the choice and are in some charge of their own lives. This may help your grandchildren feel a sense of ownership and as if their thoughts and input are meaningful, rather than out of their control. If you haven't already done so, you may want to ensure that your grandchild are taken care of beyond your own years. Find a Life Insurance Specialist in your state. Find an Estate Planning and End Of Life Specialist in your state. As long as your love is genuine and you truly care for your grandchildren, taking care your grandchildren will become easier and easier. Though it might take some adjustment at first, soon enough, your family will thrive. We hope that some of the advice given above may help in dealing with caregiving and loving your grandchildren.